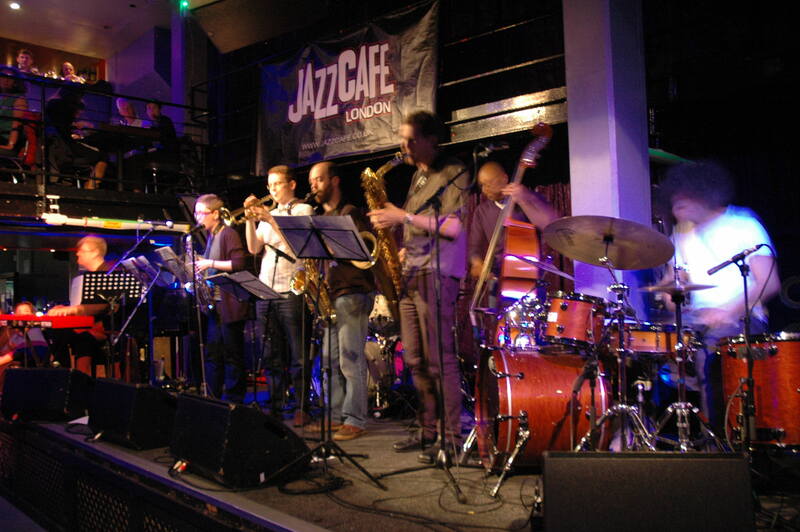 I’ve just confirmed an exciting Quadraceratops gig: Jazz In The Round at the Cockpit Theatre, Marylebone on 24th June. We’ll be one of three bands appearing at the June edition of this monthly gig presented by Jazz on 3’s Jez Nelson. More info to follow! This entry was posted in News, Quadraceratops on February 25, 2013 by cath. On February 8th I ventured into the world of gig promoting and put on a double bill at the Hackney Cut. Quadraceratops were joined by The Button Band for a really nice evening of music, pizza, cake eating and general hanging out at a venue that boasts the address ‘Fish Island’. Sadly not open for public gigs any more (nothing to do with us!) the Hackney Cut is a great space and was also home to Dee Byrne’s ‘Jazz at the Hackney Cut’ weekly night. This entry was posted in Gigging, Quadraceratops on February 19, 2013 by cath. 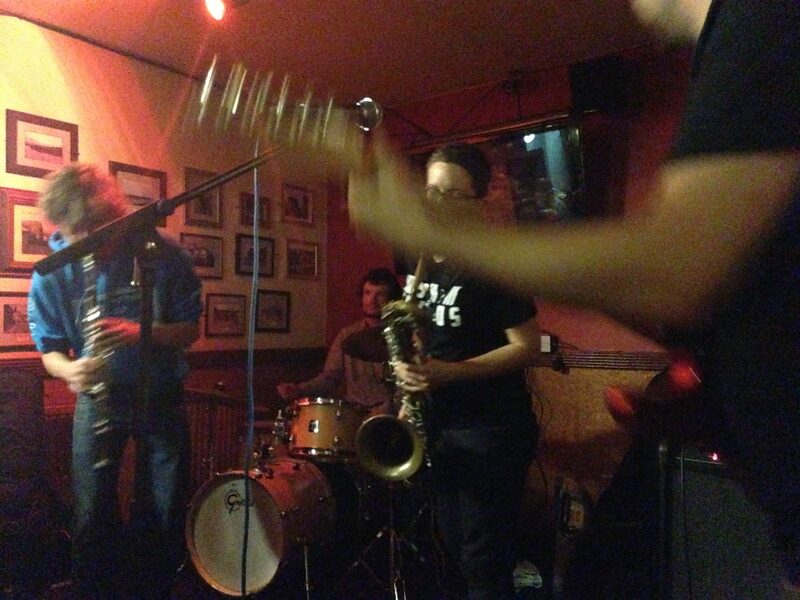 I’ll continue this afternoon of cataloguing the end of 2012 with a look back to the Madwort Sax Quartet gigs in December. We left London behind and set off on a mini-tour of The Midlands and The North: not bad for the second thing the band ever did! Arguably, as it was a pair of gigs, this should be referred to as a series, but due to the travel involved I’m going to stick my neck out here and call it a mini-tour…. The first stop was Derby and Corey Mwamba‘s ‘One Note Sunday’ night at the Flowerpot. We played two sets to an extremely interested and appreciative audience. Again, it was a cool thing to have this happen at the band’s second ever gig. The idea with One Note Sunday is that people go along to hear something new…as in, not even something they’ve listened to online in advance to see if they like it, but something brand new to them. Risky tactics, you say! Yes. But, what it means from a performer’s perspective is that the people who show up are definitely going to be there to check out the music…and that feels great! We had a good gig there. 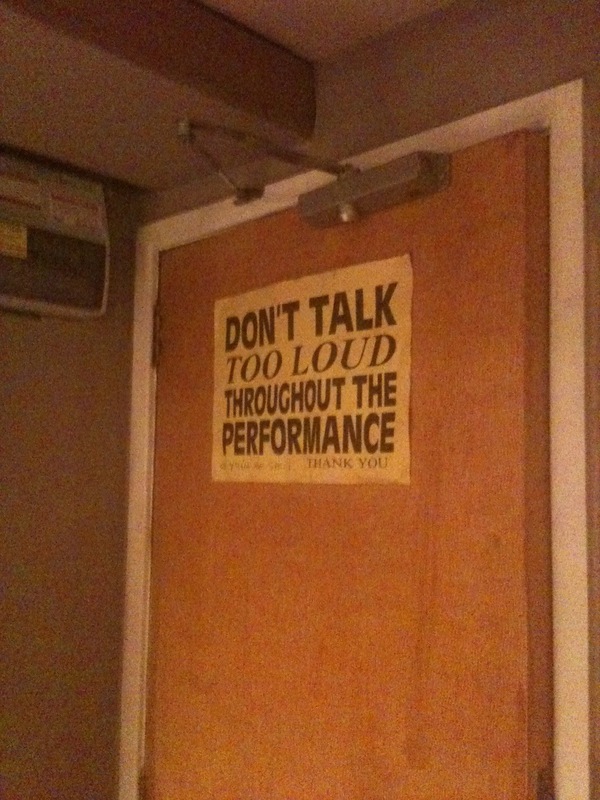 The sign below was posted by the bar but was totally redundant. Tom recorded the gig and filmed it. He’s posted a series of four videos on YouTube: the tracks are Shard, S (by Larry Ochs/Rova), Maps and Islands In The Green. Shard and Maps were new tunes that Tom wrote in time for the December gigs. After Derby, we had a day off before travelling to Manchester to play at Efpi Records’ Freedom Principle night at Sandbar. It was nice to go back and play there again after the Quadraceratops gig for them in June, which was a lovely night. With the quartet, we shared the bill with the Anton Hunter trio. I have to say, perhaps egotistically, that my favourite part of this gig was when we combined the two bands and played some of my music! Anton had clocked that if we merged the two bands we would have a sort of hybrid almost-Quadraceratops septet and he suggested we did a couple of my tunes. With, well, basically no rehearsal. More risky tactics! I like to think of it as the Madanton Worthunter Quartrio. Four saxes, guitar, bass and drums! It was FUN, and pretty anarchic. There’s a video of it, and I’ll post it up here once I get my head around cutting the video into tracks…. 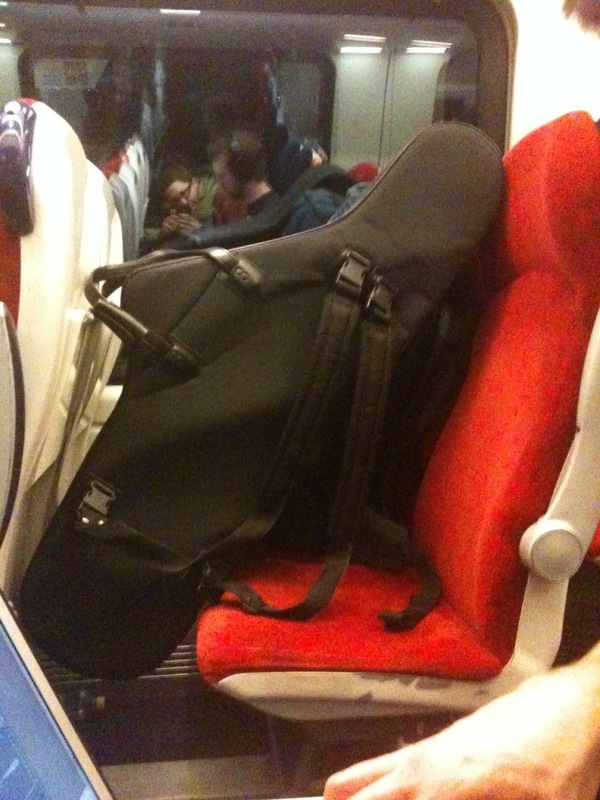 This entry was posted in Gigging, Madwort Sax Quartet, Videos on February 11, 2013 by cath. A freezing cold, snowy February day like today seems the perfect time to sift through the various photos, videos, and recordings I’ve amassed over the past three months. I’ve had a lot going on but not much time to write about it until now, so here goes. 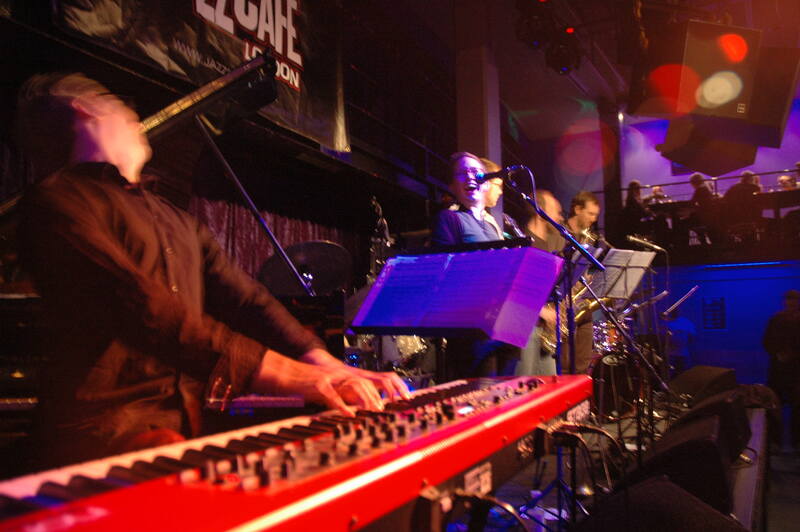 Quadraceratops were lucky enough to play in the 2012 London Jazz Festival, which was the highlight of my Autumn. 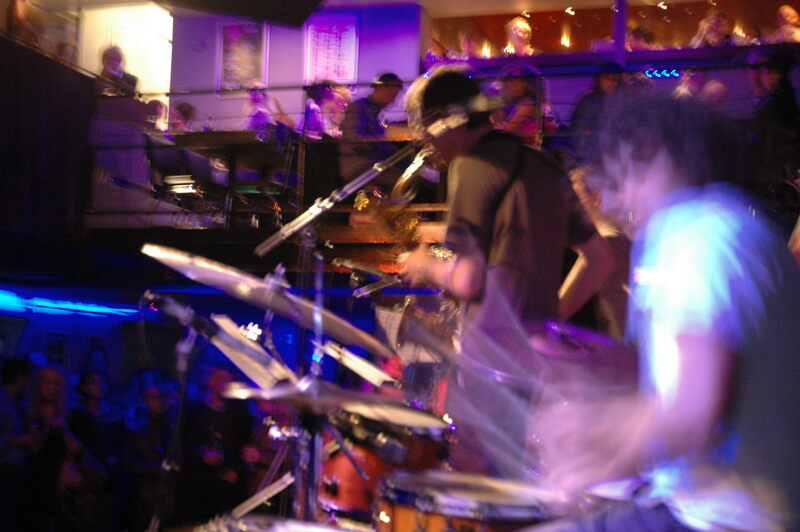 We supported Get The Blessing at the Jazz Cafe in Camden on the 17th November, playing to our biggest audience so far. It was also the biggest venue we’ve played, so the whole evening was slightly surreal and a lot of fun. Ricky Day kindly took on audience-eye-view photography duty on the night, and I’ve put up an album of his shots of the Quadraceratops FB page, plus the couple in this post. A big thanks to Dom Servini, who DJed at the gig, for booking us to come and play. 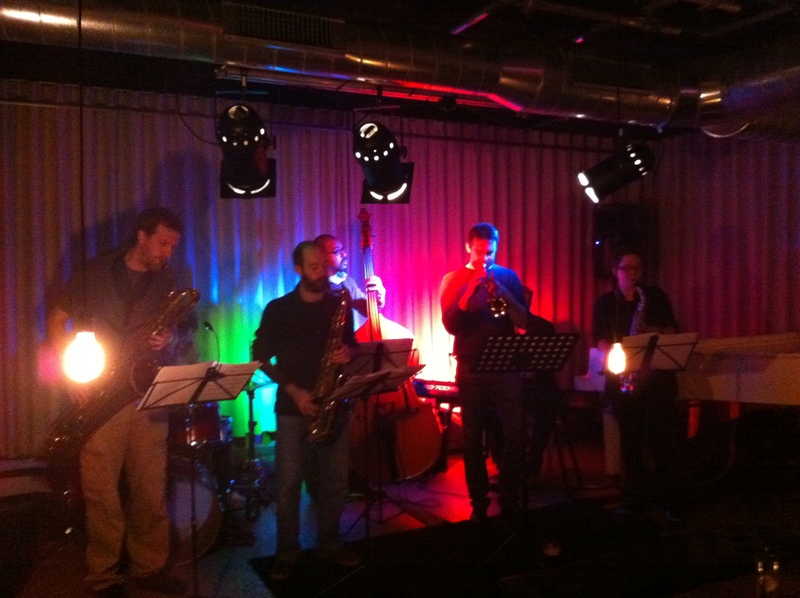 The following week we had a gig at ‘Jazz at the Waterline’ in Dalston. This is a night run by my friend Dee Byrne (although she has subsequently moved it to the Hackney Cut, due to what is hopefully the Waterline’s temporary closure). The back room of the Waterline is a cosy, intimate space and it was a nice gig for trying out some new music. I had recently finished a composition called ‘Flying South’, so it got its first outing on that night. 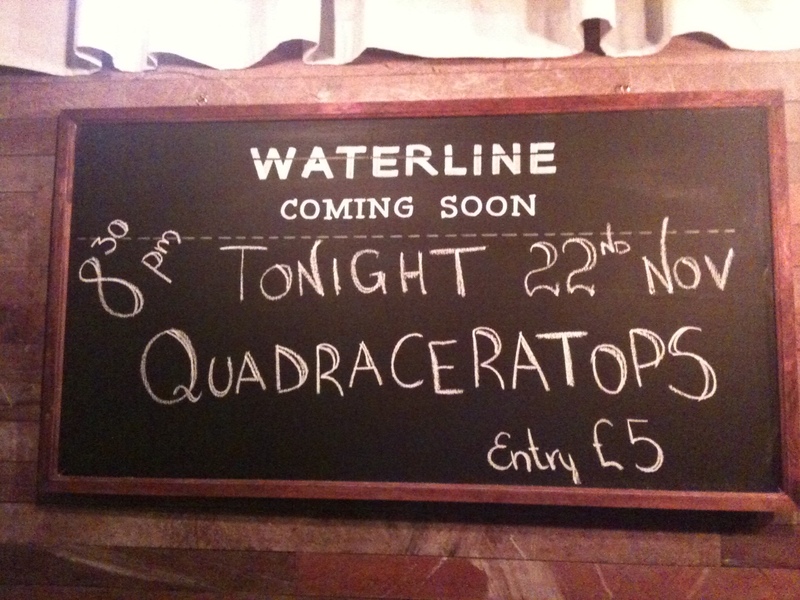 The Waterline gig was possibly also the first time that the band name has appeared on a blackboard (above) which I enjoyed. In addition, Dee took some photos on her phone including this one, below, and the trippy one on my ‘Gigs‘ page. Someone was clearly enjoying adding weird effects…hopefully inspired by the music! This entry was posted in Gigging, Quadraceratops on February 11, 2013 by cath.